UPSC Geologist and Geo-Scientist Application Form 2019 – Union Public Service Commission (UPSC) has released the Application Form of UPSC Geologist and Geo-Scientist 2019 on March 20, 2019. The online application form has been made available on upsconline.nic.in. Up to April 16, 2019, by 06:00 p.m candidates will be able to register for UPSC Geologist and Geo-Scientist 2019. The candidates who will submit the online UPSC Geologist and Geo-Scientist Application Form 2019 on time those form will be only considered for the further recruitment process. From this page, candidates will get full information regarding UPSC Geologist and Geo-Scientist Application Form 2019. 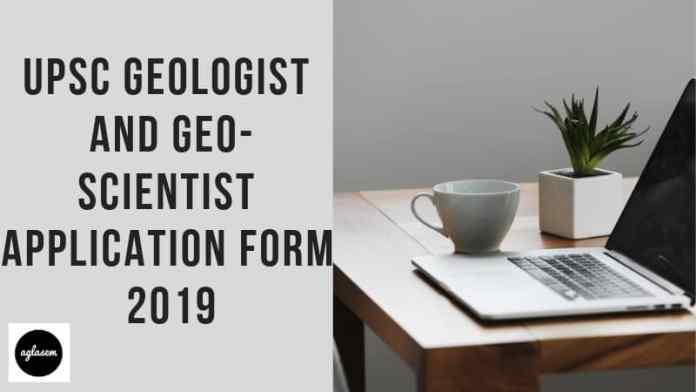 Latest: UPSC Geologist and Geo-Scientist Application Form 2019 has been released. Scroll down to access the link. In the form, candidates should provide valid details. The candidates can only online mode for filling the UPSC Geologist and Geo-Scientist Application Form 2019. For more information regarding Online UPSC Geologist and Geo-Scientist Application Form 2019 check the schedule given below. Apply Online: Click Here to fill the UPSC Geologist and Geo-Scientist Application Form. The general and OBC category candidates have to pay Rs 200/- as an application fee. The SC/ ST/ PWD category & Women candidates are exempted for paying the fee. Application Fee will be Non-Refundable. Before filling the form candidates should collect the below-mentioned documents this will help you in easily and accurately filling the form. Documents To Be Uploaded in the UPSC Geologist and Geo-Scientist Application Form 2019? From below candidates can check the documents which need to be scanned and uploaded in the UPSC Geologist and Geo-Scientist Application Form 2019? The same document which the candidates will provide in an application form should carry in examination hall along with the admit card. The OBC performance has to be submitted online by email to the commission. How To Fill UPSC Geologist and Geo-Scientist Application Form 2019? Candidates can follow the steps given below for filling the UPSC Geologist and Geo-Scientist Application Form 2019. First of all click on the above link and then click on Click here for Part I link. Thereafter, Important Instructions page will open read the information provided on the page carefully and then after that click on the Yes Button. 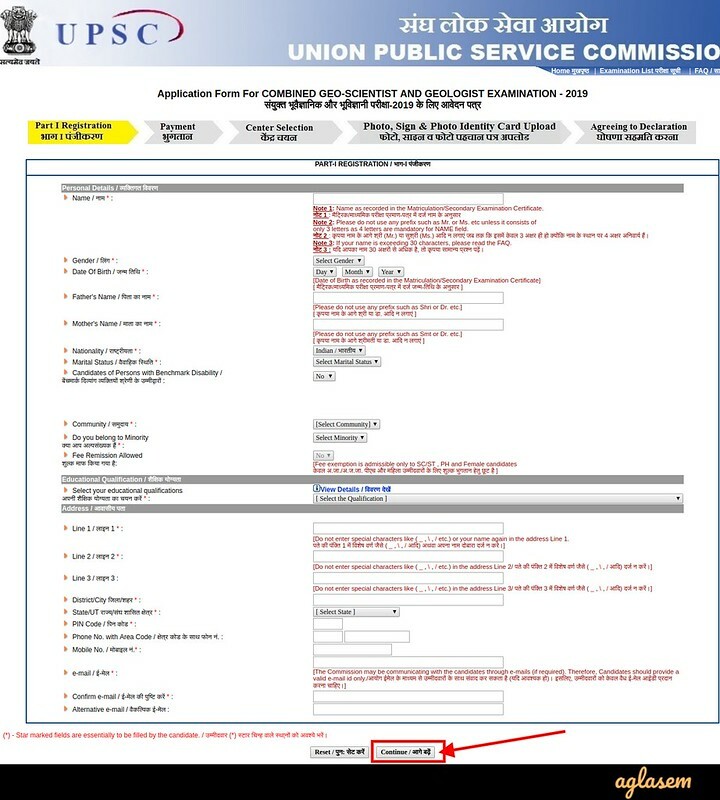 On clicking the Yes button Part I Registration page will open on that page candidates have to mention Candidate Name, Gender, Date of Birth, Father’s Name, Mothers Name, Nationality, Marital Status, Community, Educational qualification, Address, Email Id, Mobile Number, Name of Examination etc. After filling the details click on the continue button. Thereafter, Part II registration page will open. In Part II registration page candidates have to fill and complete the Payment, Center Selection, Photo Sign & Photo identity card, Agreeing to the Declaration Steps. Payment – Make the payment as per the candidate’s category. Center Selection – The examination will be conducted in the below mentioned cities so among them only candidates have to choose the center. Photo and Sign – In this steps candidates have to upload the photograph and signature in the specified format. Candidates should follow the below mentioned point while and after filling the UPSC Geologist and Geo-Scientist Application Form 2019. While filling the online application form, the candidates should first read the instructions and should decide the center for the examination. Incomplete or unfinished applications will be not accepted. No representation or correspondence regarding such rejection shall be entertained under any circumstances. After making the fee payment do not touch and press any button or refresh the page up to when any confirmation message regarding successful payment not displayed on the screen. The candidates must take the print out of the confirmation page and should take the print out of the application form for future reference.